Welcome to Épineux-le-Rainsouin, a typical French village of yellow cement houses with PVC windows and roll-down PVC shutters. Here, village gossips observe all from behind their factory-made, crocheted curtains; intensive chicken farms produce record numbers of broilers; and culture is defined by television game shows. When Didier, village employee, suddenly disappears, tongues wag: everyone knows he’s a lady’s man, too handsome, too charming for his own good. And after his body is discovered in his bath, more than one cuckolded husband sighs with relief. Equally relieved, are all the wives who knew Didier as a lover — and blackmailer. 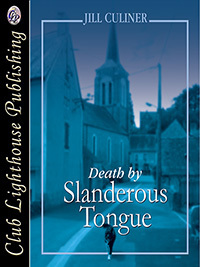 But blackmail continues, and as village secrets are exposed, it seems unlikely that Didier’s death was accidental. Before Épineux-le-Rainsouin can again settle down to its usual torpor, corruption, illegal building schemes and farming abuses, a murderer must be found. EVERYONE IN ÉPINEUX-LE-RAINSOUIN knows that Madame Houdusse’s spare change vanished on the same day Didier did, on Monday, although none of us are foolish enough to connect the two events. Didier, a grown man, strong and muscular, would certainly protest if anyone tried to steal him, whereas cash and other objects quietly disappear all the time. The church collection box was emptied in March and two gold-plated chalices were removed in April; Madame Sauvebœuf now keeps the church doors firmly locked. On the night of April 28th, parked cars on the village square were divested of their radios. One week later, Monsieur Pateau’s stock of wood was stolen from his outlying farm (he was absent at the time). The baker’s black and white cat went missing on May 5th, a disappearance not necessarily attributed to crime, although some mumble vivisection, evoke the spectre of laboratories hungry for trusting pets. Madame Houdusse is understandably upset about the disappearance of her money, once sitting pretty in a decorated bowl on the sideboard in her dining room, right next to the baby photos sent by a second cousin once removed. Leaving her front door open to air the house (the weather has now turned very fine), she went to answer a ringing telephone in the kitchen. And in the winking of an eye, the coins were gone. With each retelling, she becomes increasingly indignant. We, the other residents, are sympathetic of course, but we do not all agree as to the identity of the perpetrator (or perpetrators) of the various robberies. There are those who attribute them to gypsies — they are always the first to be accused in such cases. But no one has seen a gypsy here for well over a year, although Monsieur Vadepied claims their mobile homes were parked fifteen kilometres away along the Laval road. Madame Filoche, however, talks of a white Renault cruising through the village. Of course, we (and the police) demanded a description of the men. There are others who mention, sotto voce, the local bad boy, Gilles. Perpetually jobless, living on welfare with his wife and three grown sons, Gilles has been held responsible for the “evaporation” of many objects: a pair of wooden shutters leaning against a wall (and destined for the rubbish pile), a few tools unwatched by their owners. He had given a party for thirty in the village restaurant, but left the bill unpaid. And he has borrowed quite a bit of money over the years—from Monsieur Douspis, Monsieur Beauducel (since deceased), Monsieur Filoche (also deceased), Monsieur Viellepeau, the former baker, Monsieur Hautbois (roofer), Monsieur Berthereau (cabinet maker)—but neglected to return any of it. These days, Gilles keeps to himself. He has, indeed, been doing so for the last five years; and since no one now greets him with anything other than a scowl, he avoids us all. Didier’s absence is rather a different matter. In fact, few of us ascribed any immediate importance to it. On Monday evening, he was seen going into his house, an eighteenth century café, modified by an American hand grenade during the war (retreating German soldiers said doors should be left open to indicate there were no snipers, but the owner ignored the advice), and later renovated by Lemasson Enterprises into a pink cement structure with PVC windows and PVC roll-down shutters. Certainly, Didier had gone out again that evening — he is said to have a very active social life, especially amongst the ladies. But where he went, or to whom, no one knows. And why hasn’t he come back? Why the main character (somewhat depressing) remains in a French Village with depressing architecture, depressing food and depressing people is beyond me. There was one person in the village who was obviously not depressed, but his attempt to share his joy of life with the married women of the village may have been the cause for his murder. That had me hooked. No, I didn't guess who the murderer was, although the author left enough hints. If you like murder mysteries with local colour (depressing yellow) this is good one. Jill Culiner has a literate, yet informal style, with a good ear for dialogue and a sharp eye for the idiosyncrasies of rural village life. Despite her quirkiness in not giving a name to her protagonist, she had me hooked by the second page. 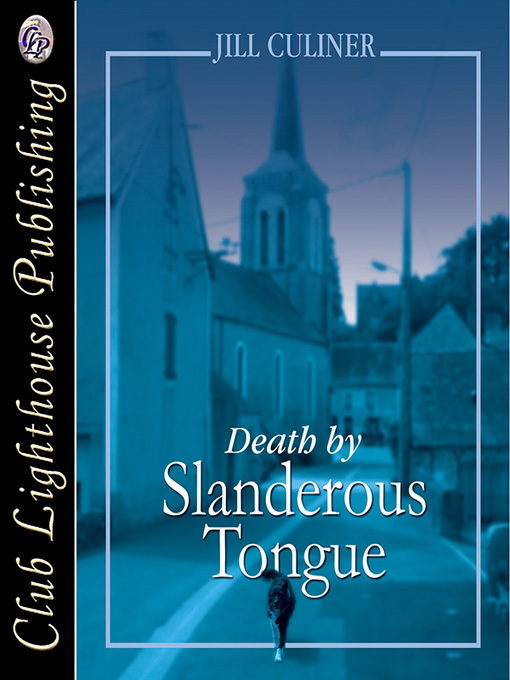 Not simply a mystery (though the author introduces several nicely-placed red herrings), Slanderous Tongue is an insight-ful study of the manners and mores of the inhabitants of a small town, with something to say on a variety of subjects. Culiner trains her lens backwards, to explore a microcosm of the human condition. She examines the minutæ of village life, the thousand and one details that, taken collectively, define people’s relation to others and to the natural world around them. Focusing first on the physical changes in village life over decades, and their disruptive effects on social patterns, she turns her attention to intensive farming techniques and their impact on the environment, and concludes with a critique of our willful ignorance of the inhumane treatment of the animals that most of us rely on for food. Although Culiner may be guilty of romanticising the past, she nonetheless paints the present as it is, warts and all. Although she is occasionally preachy, Culiner is not wrong; and although she has an unhurried approach to the telling of her tale, when she gets where she’s going the reader comes away both informed and entertained.